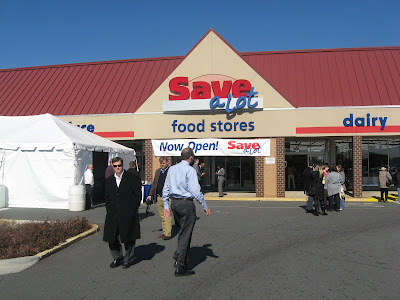 I'm headed to the ribbon cutting ceremony for the Save-A-Lot grocery store in Charlotte, NC to blog tomorrow. It is the location at 3033 Freedom Drive. The other new stores are in Kannapolis, Shelby, Fayetteville and Lexington, NC. Save-A-Lot is new to North Carolina, but they have 1200 stores across 39 states. 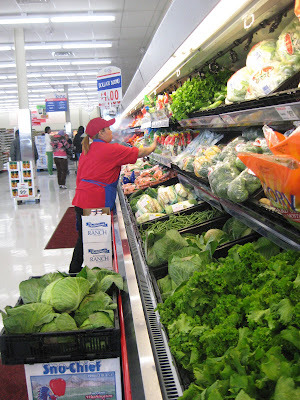 Save-A-Lot is a low cost grocery store with a focus on low costs with a good selection of fresh produce, dairy products, and fresh meats. As a griller and barbecue person, it is appealing to have the fresh items (and especially meats) at lower prices. I've not been to a Save-A-Lot discount grocery store before, so I'm excited about checking it out. They emailed and then called to invite me out for the ribbon cutting. I'm impressed that they took the time to look up North Carolina food bloggers (and especially grill/barbecue folks) and to include us in the roll out of the stores. Some companies kind of overlook the online communities. I was telling my brother, who lives in Dayton, about my plans for tomorrow. He said he shops at Save-A-Lot there in Ohio and that they do have good products and great prices. He entertains a lot, and he watches the budget but likes quality food products, so I was glad to hear that he knows and likes Save-A-Lot. 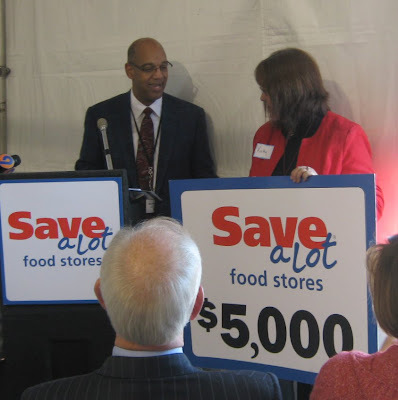 Another thing I would note is that Save-A-Lot is donating $25,000 to food banks in the local communities where they are opening stores. I notice things like that. Companies used to work hard at being good corporate neighbors. That kind of got lost over the years. It is nice that Save-A-Lot is helping here in North Carolina where many people have lost jobs with Cannon shutting down and Freightliner cutting way back (just for a couple of examples). Also, opening up grocery stores in the state means more jobs which are much needed. I'll scope things out tomorrow at Save-A-Lot. I have my Acer netbook, digital camera, and notebook packed. As always, I'll tell you what I really think. That's why I blog. I like to share solid information whether it be easy-to-follow grill recipes, coupons, reviews or just thoughts from the woman grill cave. If anyone has thoughts, observations, or tips on Save-A-Lot, be sure to leave a comment. I have my credit card packed too (-: So if you know of anything I should definately add to my grocery list, hit me with it. You did a great job with your grand opening story and the pictures are perfect. Thanks Martha. I enjoyed the visit to Save-A-Lot, and I plan to go back to shop. They did have great prices, and the products are solid - name brand and good store brand as well.